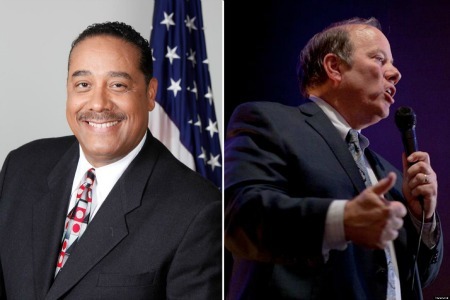 Some recent remarks made by Wayne County Sheriff Benny Napoleon in reference to potential mayoral rival Mike Duggan have the makings of old-fashioned political throwdown. At a service held Tuesday at Detroit’s New Bethel Baptist Church to remember the 150th anniversary of the Emancipation Proclamation, Napoleon painted Duggan as an outsider who lacked a personal understanding of the city’s challenges. “[Duggan] cannot say he has the common experiences that Detroiters have,” the Detroit News reported him saying. Both men have set up exploratory committees to run for mayor of Detroit, although neither has formally announced themselves as candidates. Duggan, who previously worked as the CEO of the Detroit Medical Center, relocated from Livonia to Detroit’s upscale Palmer Woods neighborhood last year. Napoleon, who was born and raised in Detroit, also took a dig at his competitor’s new digs during Tuesday’s event. On Wednesday, Duggan responded to the quip on his Facebook page. Napoleon, formerly the top cop of the Detroit Police Department and a frequent HuffPost blogger later backtracked his remarks on Twitter.